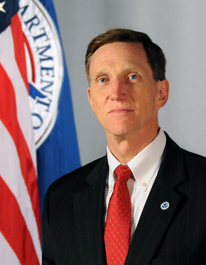 Anderson native John Pistole was an FBI agent performing routine audits of the agency’s local offices when the terrorists attacked on Sept. 11, 2001. Counterterrorism wasn’t exactly Pistole’s area of expertise. Nonetheless, he was quickly pulled into the investigation of the attacks on New York and Washington. It was a move that changed his career path and his life. Today, Pistole heads the Transportation Security Administration — an agency that didn’t exist on Sept. 11, 2001, and, in fact, was created in response to the terrorist attacks. In the aftermath of those attacks, Pistole’s work propelled him to the No. 2 position in the FBI before being named last summer to lead the TSA. Posted: 9/9/11 at 8:53 AM under FBI, News Story.